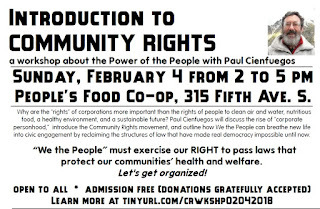 There WILL be an Introduction to Community Rights workshop on Sunday, February 4 from 2 to 5 p.m. at the upstairs Community Room of the People's Food Co-op, 315 Fifth Avenue South, in La Crosse. The workshop is open too all and FREE (your donation at the door will help us pay for the event). IF YOU CAN PRINT AND POST FLYERS, please do. IF YOU CAN SHARE THIS FLYER PIC ON SOCIAL MEDIA, PLEASE DO! 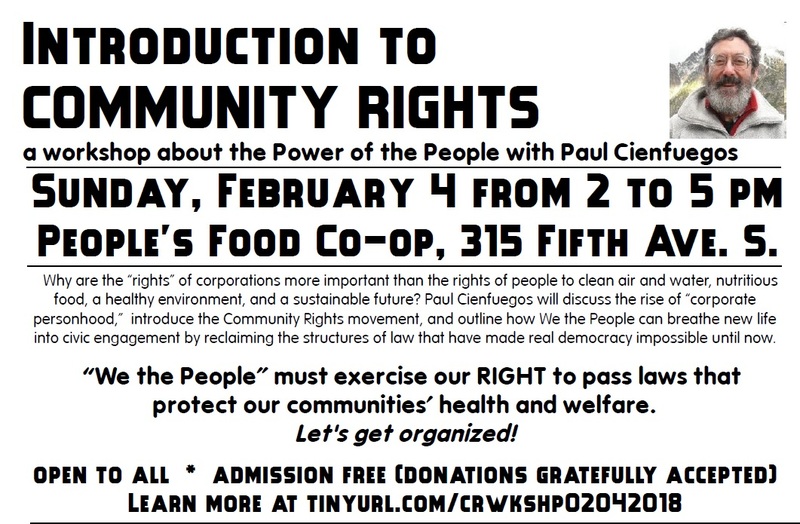 Paul Cienfuegos introduces the strategies and history of the Community Rights Movement in this three hour workshop. The Community Rights Movement works to dismantle corporate constitutional “rights” and assert the people's inherent right to govern themselves and nature’s inherent right to thrive. Paul Cienfuegos is a leader in the Community Rights movement, which works to dismantle corporate constitutional so-called “rights” and assert The People's inherent right to govern themselves. He has been leading workshops, giving public talks, and organizing local communities across the US since 1995 when he founded Democracy Unlimited in northern California. Paul moved to Portland, Oregon in 2011, co-founded Community Rights PDX in 2012, and helped to launch the Oregon Community Rights Network in 2013. 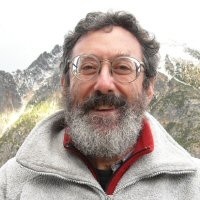 David Barsamian's internationally syndicated show 'Alternative Radio' has broadcast five of his speeches. Paul is the founding director of the new national Community Rights support organization - Community Rights US - which was launched in October 2017. More info at www.CommunityRights.US. As a long time activist, Paul believes that we won’t ever win the society we all yearn to live in until we stop just responding to the latest corporate outrage from a defensive position, and begin instead to exercise our rightful authority as We the People, The Sovereign People, to govern ourselves and to say NO to a wide variety of normalized but quite harmful corporate activities, and YES to the kind of healthy and just communities we desire to live in - all of which can be best accomplished through local Community Rights law-making campaigns. Paul has led dozens of Community Rights workshops across Minnesota, Wisconsin and Iowa over the past four years.